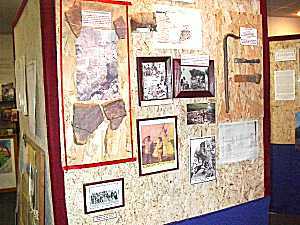 These are photos from the Museum, the displays will change from time to time as more items are added and floor space is used up. 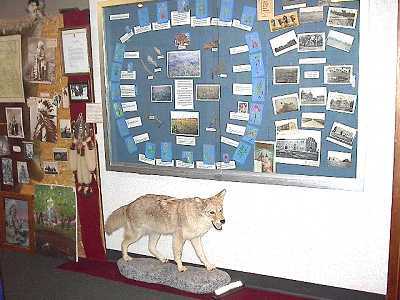 This is the latest display that has been set up in October 2003. 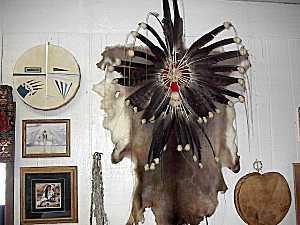 It is of the various plants that were used by the Native Americans in this area. All of these plants are native to Pipestone. 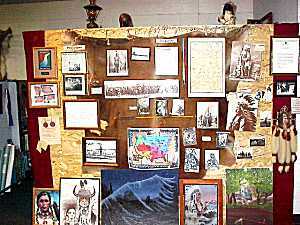 Also in this case are photos of the old Pipestone Indian School, old photos of the Three Maidens and of Winnewissa Falls. 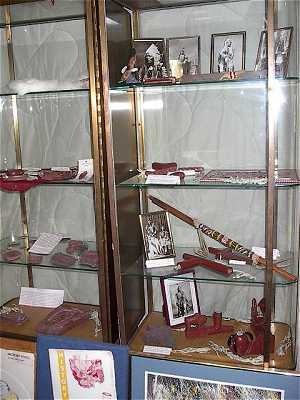 This old display case holds various Catlinite items, as well as other pieces such as an old fan that was donated to the museum by Andrea Frank. The quilt was a memorial gift from Lydia Goodsell for Ethel, Harvey and Jeffrey (Little Feather) Derby. 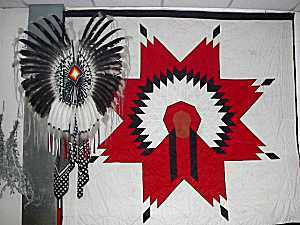 Various items of clothing are in the museum including this jacket and mocassins. Also in the museum are a jingle dress and a repro 17th century leather dress. This display also has a bone breastplate and a turtle shell bag. 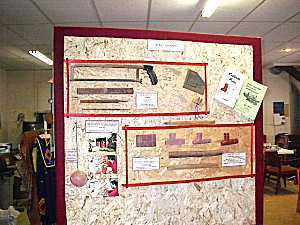 A display of quarrying items, showing the tools used and photos of an actual quarry. 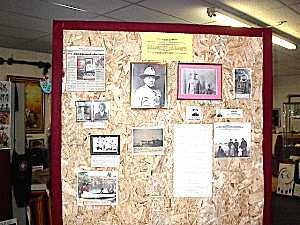 Also shown are photos of the Derby's inthe 1950's at the quarries. 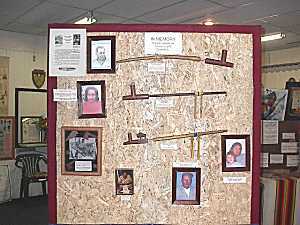 Some pipes made by our previous pipemakers are shown on this display, including photos of some of them. How do you make a Pipe? Well this panel shows how it is done and what tools are used. 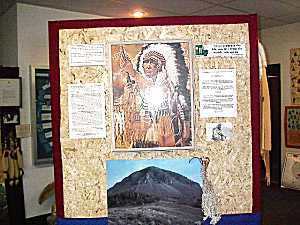 This display shows Bear Butte, and tells about the significance of the Pipe to Native People. The picture of the man holding the pipe has a specific feature which says it all. 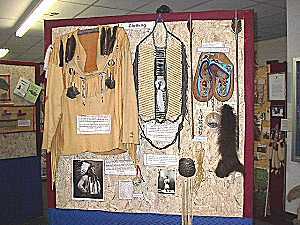 This panel shows the history of the Pipestone Dakota Community, from the patriarch Moses Crow and his wife Estella who were the first Native Americans to reside in Pipestone to the Little Feather Center of today. 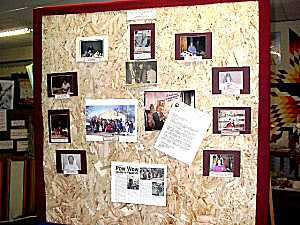 Many of the Pipestone Dakota Community are shown on this panel. Some of the craftspeople and pipemakers, the thankgiving photo of 2000 in front of the Center and the powwow of 2000 are all shown here. Chuck's working area where he will show you how a pipe is crafted. 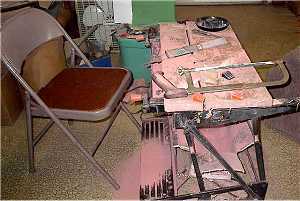 The box under the bench is full of Catlinite dust which is given to Sundancers to use. 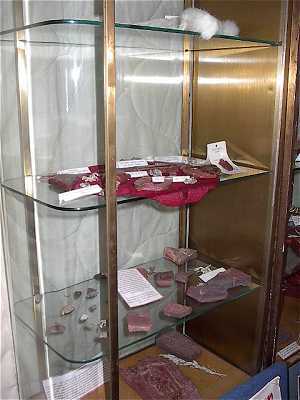 This display cabinet is full of Catlinite items, many of them are artifacts that have been found locally. A lot of them have been stone carved. Various pipes are shown in this side of the case. 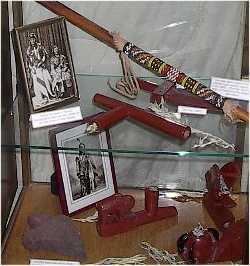 A small lip pipe is in complete contrast to the large ceremonial bowl and highly beaded stem. And this Bald Eagle feather bustle has found a home next to a memorial quilt. 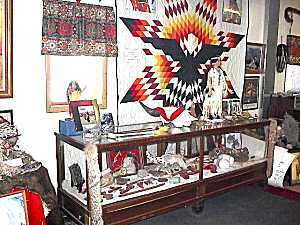 This wall shows various photos of Native Americans such as Little Crow in 1862, to Sitting Bull a few years later. There are also pictures of the Petroglyphs in Pipestone and an old map of Dakota, before is was split between north and south. This is the area of the Princess Diana display room. 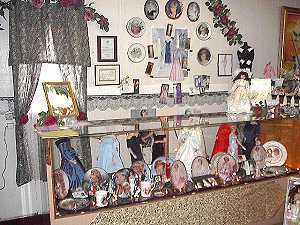 Many of the items that were included before are gone, but the dolls and plates are still here along with all the books and the Princess Diana standee. 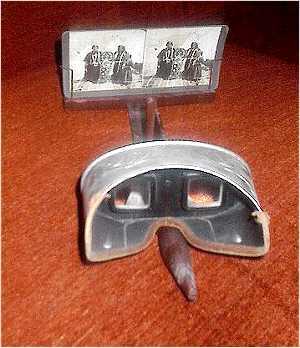 We have been loaned a stereoscope and a number of stereoptican photos of early 1900's subjects including Native Americans from that time. This small wonder makes the pictures look 3D.